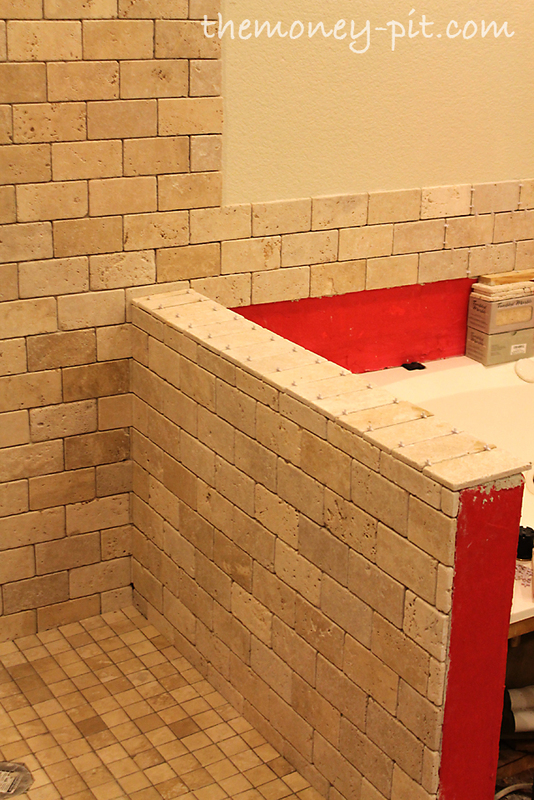 A little update on the progress I am making on the tiling. At this point I am in the home stretch. 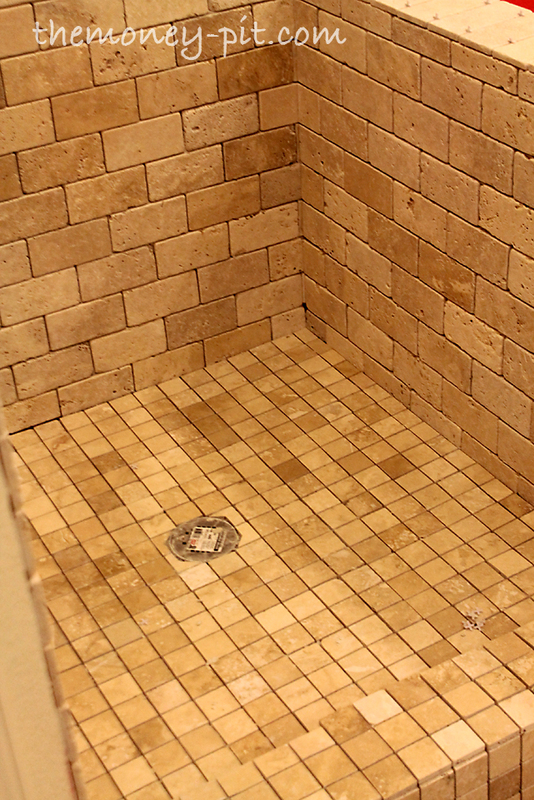 I finally got around to the part of the tiling job I dreaded the most: THE SHOWER FLOOR. Because of the slope and round drain I was nervous about how the tile would come out.I decided to go with 2x2 honed travertine for the floor. 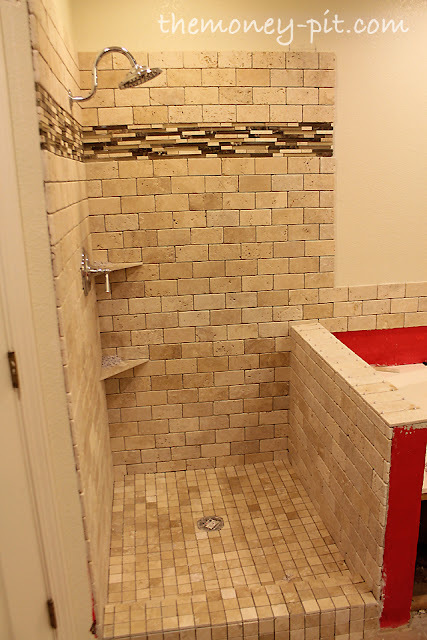 The smaller tile size is much easier to work with, especially on the slope, and the honed, smooth finish would stand up to the grime of the shower floor better than the porous tumbled type I used on the walls. This wasn't a budget friendly decision, since unlike my wall tile, one square foot sheets of the 2x2 tiles were $10 each. You can see I also decided to carry the smaller tiles up and over the top of the curb. This was really a decision based on the dimensions of the curb. Using the 2x4 tiles would require a lot of really thin cuts that would have been really obvious, but using the 2x2 tiles let me use nearly whole tiles across the whole surface. On the knee wall I stuck with the tumbled travertine 2x4s. I have been saving the absolute BEST tiles for the top of the knee wall. The ones with the smoothest finish that were most matched. Because this surface will get hit with a LOT of water I wanted tiles without any nooks and crannies for stuff to get stuck. You can also see how I decided to not break the running pattern between the tub area and the shower. I just continued three rows of tiles above the bathtub at the exact same height and will end up having to cut the tile closest to the tub. I will also use a row of accent pencil tile around the entire tub, and decided to locate the stripe based on where it could run as a continuous line including along the knee wall. Now I only have the tub area to finish up. I still have to put the front back on the roman tub but at this point I can order the glass for the shower doors and walls! Each time I see one of the rooms you've done I'm so impressed! You are awesome at what you do! Looks great. It looks like the room (or closet?) door opens onto the shower door. The doorknob can't hit the glass door? You are doing a wonderful job! You totally amaze me every time you post a new update! This is coming along so beautifully and it is so fun to watch you every step of the way and seeing the decisions you make and why you make them...I can't wait for your next post!! looks fantastic! you inspire me that i could do it too. 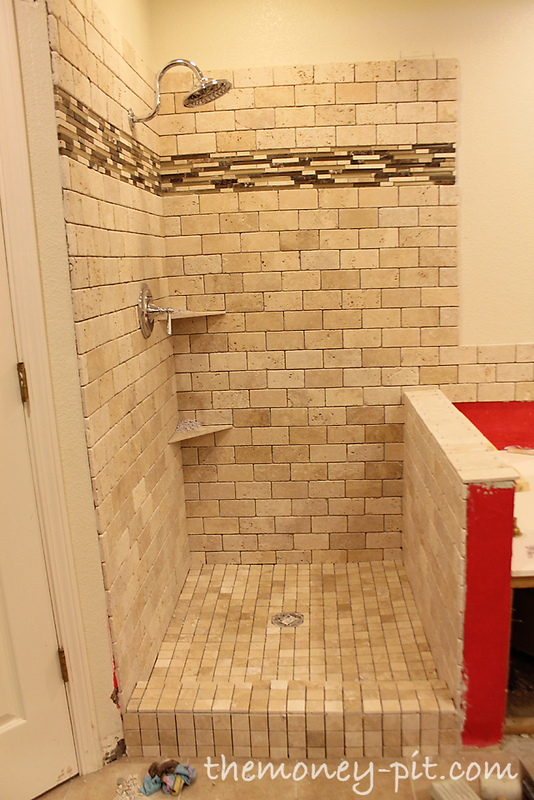 We did our backsplash yesterday, but the whole shower seems daunting! but, again, you make it do-able!